Barks & Squeaks sell gifts for your furry friends. 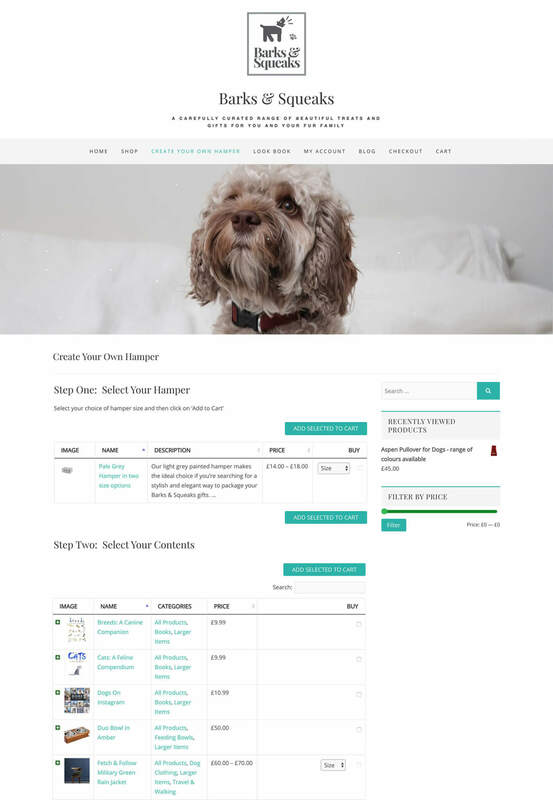 They used our bestselling WooCommerce Product Table plugin to create a build your own pet hamper page for their website. It’s very popular as a WooCommerce ‘build your own product’ plugin. This is a great example of how to use it. The build your own hamper page guides the customer through a 3-step process. First, they select the hamper type from a product table containing a variable product with different options in a variations dropdown. Next, they choose the contents of the build your own hamper. The hamper products are listed in product table layouts – 1 for large items, 1 for medium items, and another for small items. Step 3 of the process guides you to the WooCommerce cart and checkout so you can place your order and pay online.